Virtual Reality Hypnosis has the potential to change a person’s life. There is an incredible amount of personal power that can be accessed through hypnosis. Still, so many people remain hesitant to try based on one single emotion, and that’s fear. It’s fear of not being able to relax, fear of not being able to let go and fear of failing. While these fears are very real for the person feeling them, the truth is there’s no way to fail at hypnosis. One only needs to open themselves up to the possibility of success. For those that have difficulty with opening themselves up and completely relaxing, modern technology offers a solution in the form of virtual reality. In the field of hypnosis, therapies involving virtual reality are proving to be incredibly therapeutic, healing and capable of lifting the patient out of themselves to break through self-limiting barriers. The potential therapeutic benefits of virtual reality, also referred to as VR, are practically limitless. 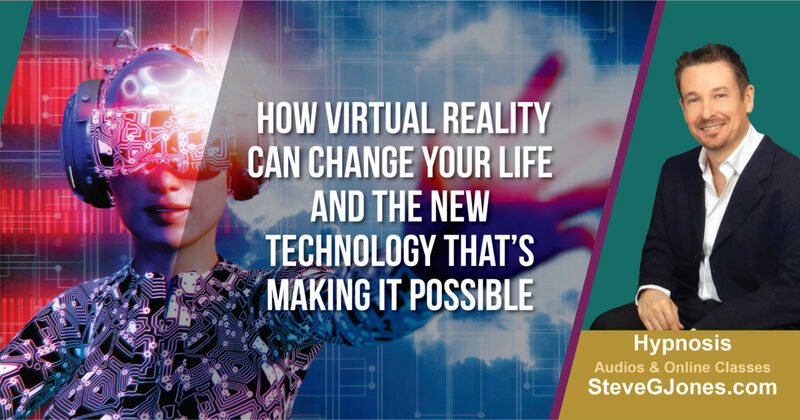 Before going into the many ways that virtual reality hypnosis can heal and improve a person’s life, it’s best to start with a brief introduction of virtual reality and the scientific backing of it’s use for hypnotherapy. To answer this question, it’s important to start with an understanding of how reality is perceived. Reality is an accumulation of sensory stimuli. At any given moment, a person is using the combination of all their senses to create their picture of reality. As proof of this, take into consideration what happens when there’s a lack of sensory experience. Sensory deprivation has been used as both a form of punishment and to further explore the depths of human nature. This is because lack of sensory stimuli is disorientating and takes away the foundation that reality is built upon. Virtual reality is technology that’s used to extend reality as we know it. VR technology introduces new stimuli in a way that mimics actual reality, forcing the mind to expand its concept of what’s real and what isn’t. Simply put, virtual reality is an artificial environment that’s created with the help of special equipment and software. The goal is to stimulate the senses in such a way that the user temporarily feels as though what’s presented to them is the reality of their environment. This technology has been used in gaming for years, but what you might find surprising is that virtual reality has been around in some form since the 1800s. Recently VR has expanded, and we’ve begun to discover its potential for improving lives, most notably, through hypnosis. Over the past decade, there’s been a growing number of studies on the use of virtual technology in the medical field. Most of these studies have centered around the use of VR technology for pain relief. One study in particular, Application of Virtual Reality Technology in Clinical Medicine, is of huge interest because it details and provides evidence of the many ways VR technology can be used for healing. The abstract starts out by discussing the use of virtual reality in training physicians and surgeons in specific procedures. Rather than hands on operating room experience, students are given the opportunity to perform through extremely realistic virtual reality technology. While this is interesting on its own, it’s what’s discovered further down in the abstract that really caught the attention of those in the field of hypnotic healing. Virtual reality has been shown to be effective in relieving and managing acute and chronic pain. At first, the effects were tested using a type of VR game, that when used in conjunction with other traditional therapies was beneficial in relieving pain. 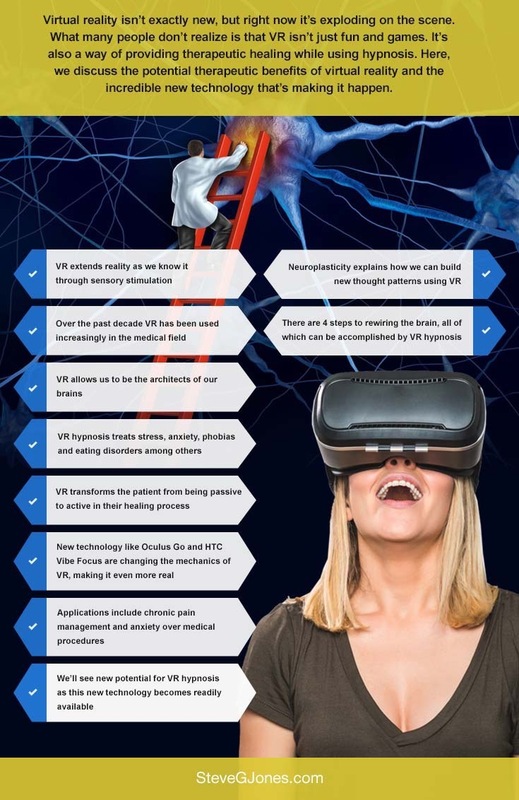 Taking this one step further, researchers looked at what happens when hypnosis type VR programs are used for pain management, and this is what they found. When exposed to “distraction” type VR stimuli during hypnosis, the patients felt both less pain and less anxiety about their current level of discomfort. The example in the study mentions that patients are glided along an icy environment where they can basically float along, or interact with some of the elements. What happens here is that the mind is tricked into believing that reality has changed, and so it adapts to the new environment, which for people in the study, included less stress and pain. Wonderful, right? Virtual reality can help people manage pain with less need for pharmaceutical treatments. Who wouldn’t be on board with this? Each step we take with virtual reality in any of the healing fields leads us to the point where it becomes essential to look at how and why virtual reality affects the mind. In the same study mentioned above, researchers also looked at how VR hypnotherapy is used to effectively treat certain psychological conditions such as anxiety and phobias. For these two conditions, exposure therapy has been shown to be extremely effective. The challenge with this is that exposure therapy isn’t always practical, or even possible. Take for example, someone with a debilitating fear of flying. Exposure therapy can certainly help them deal with their anxiety, and eventually overcome their fears. The only challenge with this is that repeated exposure to the situations that cause them distress is extremely costly, and not even in the realm of practical for most people. Sure, there are tools like flight simulators that can be used, but even these don’t fully place the patient in the reality of the environment that causes them the most fear. Virtual reality, on the other hand, is about as close to flying that a person can get without actually doing so. Through VR, a patient can learn to adapt to the sights, sounds and feelings of being in an aircraft. They can even confront more distressing situations like extreme turbulence, or troublesome passengers, and face their fears head on in an environment that’s completely comfortable and safe. When it comes to treating psychological disorders and emotional distress, there’s only so much that can be accomplished on the proverbial therapist’s couch. Real treatment begins when the patient learns how to think, react, and behave in real world situations. For many people, this means taking a step out into the world and trying the waters for themselves. Virtual reality hypnosis provides a realistic playground on which to build these skills. Rather than a practitioner accompanying the patient into the environment that causes them stress, the entire scenario can be lived out using headset and software. This gives both patients, and the people treating them a little more freedom in developing the best course of treatment. But, say a person isn’t dealing with what someone might consider to be a significant psychological issue. Maybe they’re looking to feel a little more motivated, finally quit a bad habit or improve their concentration and focus. Can these things also be addressed using virtual reality hypnosis? Yes, absolutely they can, and it all begins with something called neuroplasticity. Neuroplasticity. It’s a fascinating subject. There once was a time when we firmly believed that the brain wasn’t capable of rebuilding, or redesigning, itself. If someone suffered brain damage, or lost a specific function, the idea was that it was gone forever. Today, we know that this isn’t entirely true. Certainly, there are some circumstances that can’t be overcome, but we’ve learned that the brain has a tremendous ability to adapt to changes. Neuroplasticity is a term used to describe the brain’s ability to essentially relocate functions from a damaged area, to one that is healthy. Take for example, skills that are rebuilt after suffering damage from a stroke, or going blind in one eye, but adapting by the vision in the unaffected eye growing stronger. These are examples of functional neuroplasticity at work. In hypnosis, we also look at a second type, known as structural neuroplasticity. Structural neuroplasticity refers to the ability of neurons in the brain to change their behavior by forming synapsis as a direct result of sensory stimulation, like what can be found in a virtual reality experience. There is communication between nerve cells that is a direct response to new stimuli and new experiences. This is a lot of science talk, but what it means for those of us without degrees in neuroscience is that we, with the right tools, can play the architect’s role in creating how are brains perceive reality and react. In other words, neuroplasticity opens a window for each of us to create our best lives. In his book, “Rewire the Brain”, John B. Arden, Ph.D., outlines the four steps to rewiring the brain. The acronym spells out FEED, and the steps include Focus, Effort, Effortlessness, and Determination. This is perfect. We FEED the subconscious brain to create change. Hypnosis using virtual reality can help you through each of these four steps in creating the types of changes you need in your thinking, your feelings and your health. During the virtual reality hypnosis experience, a client is guided to the point of intense subconscious focus by being completely submerged in a healing or transformative environment. In some cases, this can be as intensive as virtually working through a difficult situation or emotion. More often, virtual reality in hypnosis is used to help facilitate the process of going deeply within yourself through imagery and a sensory experience that completely draws the client in, until they are so calm and relaxed within the virtual environment that change is practically effortless. The potential for healing using virtual reality hypnosis is untapped. Even though we’ve seen an increase of research in this area during the past decade, we are just now really beginning to understand how transformative this type of therapy can be for almost any individual. Virtual reality is an exciting possibility for clients that are suffering from anxieties or fears involving therapy. These feelings can stem from hesitation about the hypnosis process itself, or fear of coming face to face with the roots of distress. Virtual reality hypnosis creates an environment where it’s easier for the person to let go of those fears and fully wrap themselves in the experience. When this happens, it becomes easier for the client to absorb the guidance of the therapist that is leading them through the session. For people wondering if hypnosis with virtual reality is something worth considering for their challenge or condition, the answer is almost always yes, although the only way to know for sure is to try. Here are just a couple examples of common reasons a person seeks out hypnosis, and how virtual reality can enhance each experience. It was mentioned early how VR hypnosis therapy can help a person overcome their phobias and fears by helping them adapt slowly and naturally to the very situations that cause them distress. This is likely because VR has been linked to increased engagement during therapy. The goal of hypnosis is to help the patient to relax and let go to the point that engagement is effortless. While this is the goal, it isn’t always the outcome. Even in the most desirable of conditions, emotional and mental blocks can show up, causing the process to be slower and more difficult. The higher rate of engagement with VR hypnosis means more effective treatment and better outcomes. Depression shares some of the same biological mechanisms in the neural substrates as chronic pain. This makes perfect sense considering those that deal with chronic pain often experience depression as a co-morbid condition. Of course, hypnosis is used to treat depression from other sources, but the connection between the two is especially interesting when looking at how to best treat depression using VR hypnosis. Virtual reality hypnosis is an extremely effective method for achieving a state of altered consciousness that can sometimes be difficult to reach with the guidance of clinician alone. The deeper state of immersion, and complete relaxation help to ease depressive symptoms in the same way that chronic pain sufferers were able to achieve relief from their symptoms using VR technology. It’s practically impossible to find someone who doesn’t suffer from stress on some level from time to time. The truth is that stress, in low amounts, is beneficial. It helps us react appropriately to dangerous situations. Stress is also behind those butterflies in the stomach before a big event. Stress comes with good life events just as much as the less pleasant ones. We just tend to not recognize it as much. The challenge with stress occurs when it becomes chronic. Constant stress serves no purpose other than to cause damage to both mental and physical health. To be our absolute best, we need to acknowledge that it’s often unavoidable, but the key is recognizing it and learning to work with it effectively. Virtual reality hypnosis brings the user to a place of calm serenity and helps them gain the necessary perspective for controlling stress in their daily lives. In this line of work, we frequently see clients that are unhappy with the way their body looks. For some, this is about riding themselves of excess weight by taking control of their dietary habits. Other times, the issue is even more complex and involves redefining the way they view their body and working on healing thought patterns and habits that lead to self-destructive behaviors. An eating disorder is defined as a range of psychological disorders characterized by abnormal or disturbed eating habits. It’s important to note that eating disorders include the entire range from starvation and purposely under nourishing oneself to overeating at the point of compulsion. There is a difference between wanting to lose, or gain, a few pounds to feel better about yourself, and a deeper psychological condition that overrides self-control and judgment. While virtual reality hypnosis can be used to treat either, if you’re suffering from a true eating disorder, you should also be under the care and supervision of a qualified physician. Of all the areas where research on virtual reality and hypnosis has been conducted, the effect on this type of therapy for eating disorders is limited. That said, this abstract notes that there’s promising evidence to show that VR therapies help patients identify how they experience their body image and the specific triggers that lead to eating disorder behaviors. So, we can look at the potential benefits of virtual reality hypnosis and be wowed by them. The next question is how technology is adapting to our increasing interests in integrating VR into more areas of our lives. Those on the forefront of VR technology have some great developments on the horizon. One of the most exciting advancements we see is scheduled to be on the market early this year. This great new VR gear is called Oculus Go, and it’s rumored to be the one tool that finally makes VR financially accessible for more people. Oculus Go is a stand-alone VR device that at $199, costs a fraction of other devices with similar capabilities. The cutting-edge technology of this device includes a fast switch LCD display with amazing resolution and lenses that produce minimal glare. Additionally, spatial audio is built into the headset for a truly immersive experience. While this technology is set to revolutionize the social media experience, in the hypnosis community we can’t help but look at this technology and see potential for therapeutic healing. The more integrated the user feels with the VR experience, the greater the effect of any hypnosis technique applied. Devices like Oculus Go, not only create a more effective VR hypnosis experience, but the price range puts in reach of more people who need it. New technology from Oculus Santa Cruz is focusing on something called inside VR. With this development, virtual reality gear will be built to take the users actual surroundings into account. Sensors on the outside of the unit allow the software to better orient the head and hand movements in virtual space. It also takes the virtual experience one step deeper by making it seem more real, and more connected, to the reality outside of the device. For hypnosis, this is going to not only mean a deeper, more transformative experience, but also greater flexibility in how and where VR hypnosis can take place because these devices will no longer need to be tethered. While VR has been used in gaming for years, it’s really been Facebook’s involvement that’s brought it more mainstream. Admittedly, Facebook probably isn’t the first thing that comes to mind when thinking about therapeutic hypnosis. But, what Facebook has showed us about the potential of VR interaction has us thinking about where they future of hypnosis is heading. Facebook is striving to make VR a social experience. This brings to mind ideas about the possibilities of interactive VR hypnosis. Think about the possibilities if you could use virtual reality hypnosis by yourself, and with your partner, as a form of relationship therapy. Or, if you could bring in someone trusted and close to you to share your hypnosis experience while learning to deal with a difficult issue. Yes, these ideas are way off into the future, but they illustrate the vast potential of VR hypnosis as technology continues to advance and becomes more mainstream. As the development of untethered devices continues, we can look forward to more ways of using VR technology in hypnosis. For example, right now there are great apps that can be downloaded onto any smartphone, and with the attachment of a low-cost headset, a virtual reality hypnosis session can be yours without ever needing to step into an office. As headsets get more advanced, like the HTC Vibe Focus which could quite possibly be the first standalone, 6 degree of freedom device on the market, the challenge becomes how to adapt VR hypnosis so that each person that uses it receives the ultimate experience and maximum benefit. Soon, you could be curing your fear of flying while roaming around your own living room or facing your fear of heights by virtually skydiving while holding your best friends hand. Soon, the reality that we know and the reality that we create for ourselves will become more blurred, seamlessly blending together. With new VR technology, we have the potential be the architects of our own lives. It’s wonderful and exciting to think about what the future of VR hypnosis can be.